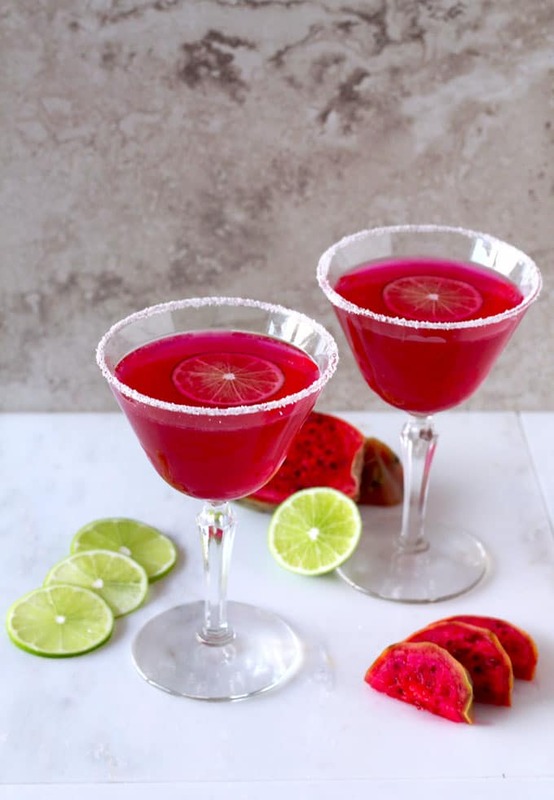 This Prickly Pear Margarita is hot pink and beautiful. 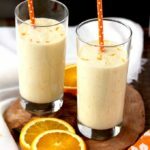 So easy to make and very tasty! 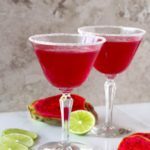 Wow your friends by serving this Prickly Pear Margarita at your next gathering! Be bold, be different! I’m pretty sure they will ask you for the recipe! Prickly Pear, also called Cactus Pear or Tuna Fruit is the fruit of a cacti named nopales – which is also edible and usually cooked in savory dishes like stews, soups, sautes and salads. They are native primarily in the Southwest of the United States and Mexico. Prickly Pears range in colors from lime green and orange to deep red. The color however does not indicate the maturity or ripeness of the fruit. They are covered in rough bumps and have tiny, barbed spines. Of course, unless you go to the desert to pick your own fruit, you don’t have to worry about spines. The ones sold at the market are already “spine free”. The inside of the fruit has the most vibrant hue of pink however, the flavor is mild, delicate, not too sweet and a bit floral. 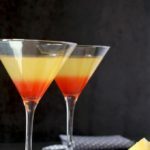 The taste is like a combination of a watermelon and bubblegum (yes, I know it sounds a bit weird but apparently – and according to google – that is the description most people come up with). You can rim the glasses with either salt or sugar. Hot pink and beautiful. 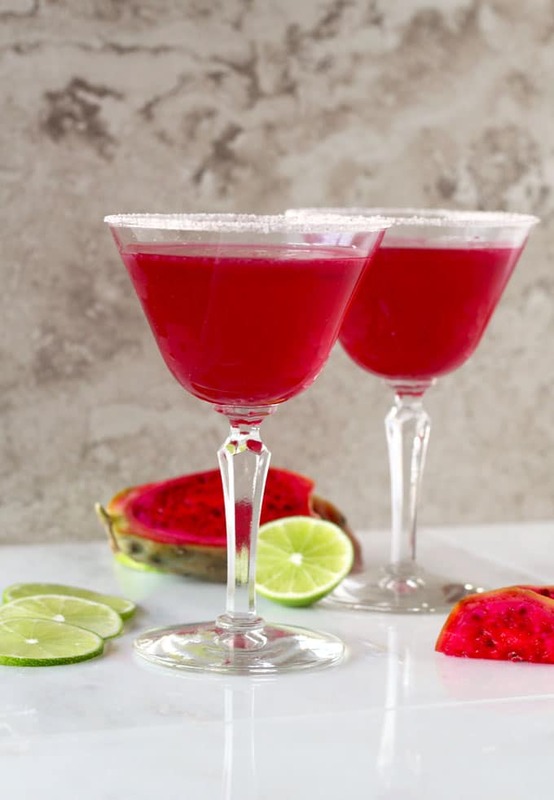 This prickly pear margarita is easy to make and super tasty! 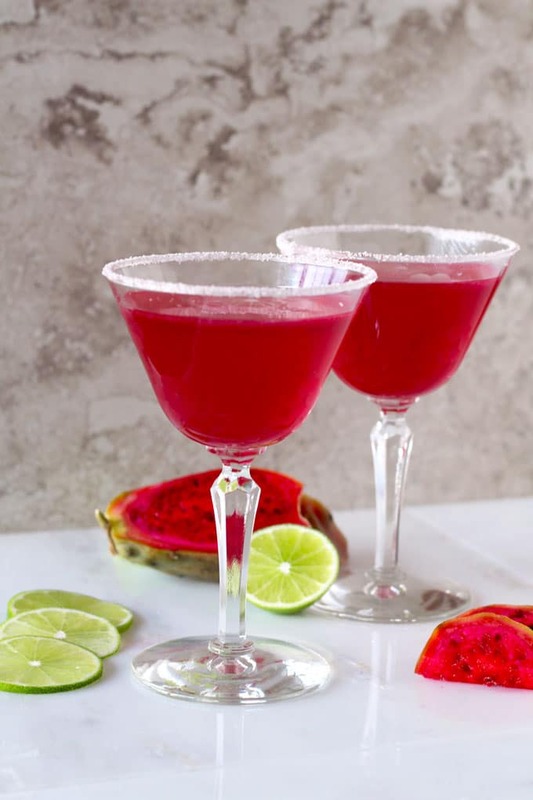 Pour the tequila, triple sec, prickly pear syrup, lime juice and ice cubes in a cocktail shaker. Shake vigorously for about 30 seconds. Strain into the glasses and garnish with a lime slice. You can serve it over ice if you wish. 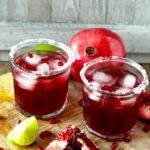 Pomegranate Margarita ~ The Best Margarita Ever! Previous Post: « Grilled Chicken with the Best Balsamic Herb Marinade!